Sometimes you may need to urgently make a person an injection of a medicinal product, and the medic nearby is simply no – where to get help. Why you should know how in case you need injections at least by intramuscular injection, as intravenous injections to do it yourself is still not recommended, it is better to entrust this procedure to people who have relevant experience or medical education. Intramuscular injection can be done in the gluteal muscle or into the thigh muscle. To determine a suitable location for injection in the buttock, you should mentally divide it into four quarters – the prick needs to be done in the outer upper quarter. Selecting the right place for the shot, you will eliminate the possibility of getting game of the syringe into the sciatic nerve. If an injection is to be done in the thigh muscle, the injection site will be at its front outer surface (in middle third of the muscle). If you've never done the injections, do the pre - "markup" muscle Zelenka or iodine – so you will not go wrong. By the way, to make injections necessary for the patient, which is then the muscles will be relaxed, and the risk of breaking the needle or not to introduce her to the desired depth is minimized, and injection does not seem too painful. 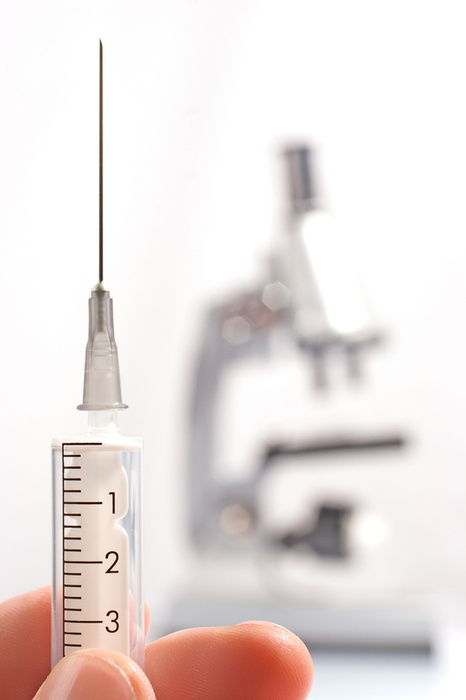 The syringe should be with a long needle short needle may not reach the muscle, and the injection will be done under the skin (resulting in inflammation). Before you inject, wash your hands, put the needle cap on the syringe, remove the cap and draw up the medicine, tapping his fingernail on the syringe. The air in the syringe will rise to the top – it should be issued, holding the syringe vertically. Wipe the injection site with alcohol and a sharp precise movement insert the needle at full length. The drug should be administered slowly after the injection the injection site of the medication should be re-disinfected with alcohol.